This quarter grades 6 and 7 completed many tiers of the Design Thinking process. First they participated in the Egg Drop design challenge. We had several eggs make it safely to the ground from 12 feet. We moved from dropping eggs to tossing wooden balls using handheld and table launchers. Then students learned about the Upper Valley mouse infestation from a November Valley News article and began designing mouse traps utilizing the entire Design Thinking process -Empathize, Define, Ideate, Prototype, Test and Share. These were not any old mouse traps. Students interviewed their teacher about her “mouse trap conundrum” -her problem: she has house pets that are not mousers and she worries about the dangers of off-the-shelf mouse traps that typically use animal poison and automatic traps. 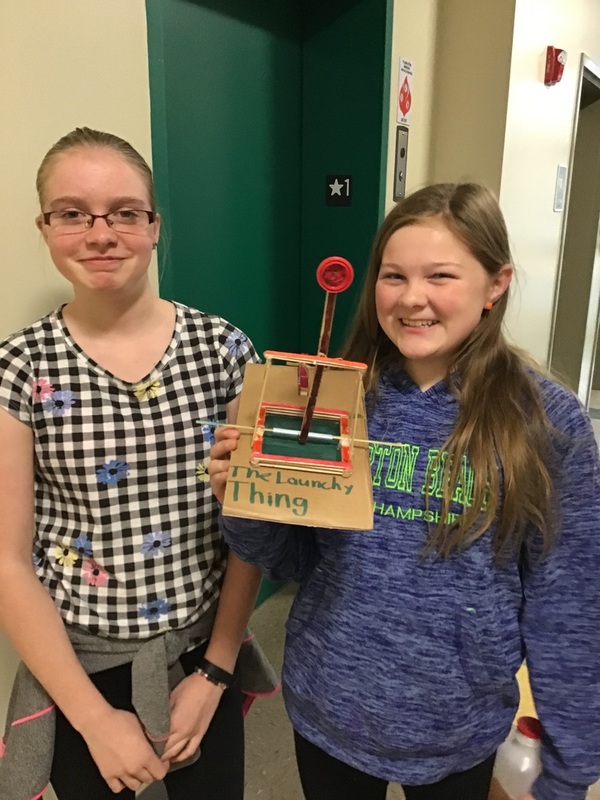 Students listened to their teachers worries and needs and from their came up with mouse trap designs, then adapted their designs based on feedback and created prototypes to share with the class. Sixth grade is currently finishing up their marble runs, which move beyond the defined criteria by integrating themes like amusement parks, water parks and circuses.